Review by AllTheBestFights.com: 2016-08-20, disappointing fight between Carlos Molina and Carlos Gorham: it gets two stars. The former Ibf light-Mw champion Carlos Molina entered this fight with a professional record of 26-6-2 (8 knockouts) and he is ranked as the No.19 super welterweight in the world. He lost to Cornelius Bundrage in 2014 (=Molina vs Bundrage) but then he has won four bouts beating Javier Prieto in his last one (=Molina vs Prieto). His opponent, Carlos Gorham, has a boxing record of 16-3-0 (10 knockouts) and he entered as the No.46 welterweight. He suffered his last defeat when he faced Omar Tienda in 2012, since then he has collected nine consecutive victories. 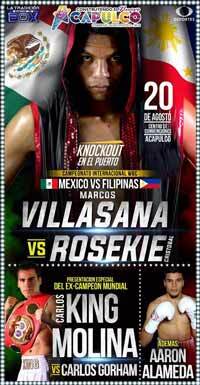 ‘King’ Molina vs Gorham is on the undercard of Marcos Villasana Jr vs Rosekie Cristobal. Watch the video and rate this fight!